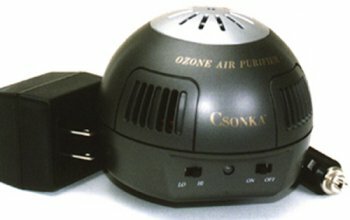 The Csonka Original model is a very versatile product for odor elimination for both AC and for DC applications. It has been used quite successfully for odor control from all sources including: smoke, pets, chemicals, healthcare, culinary, and much more. It has varied use capabilities, because it is supplied with both power plugs. This includes both a 12 volt DC plug for use in cars, campers, RVs, boats and all other locations that have access to a standard 12 volt DC outlet and also a 110 AC power plug (220 for international) for all home office and facility utility. Designed for use in homes or offices, the Original is perfect for 500+ sq. ft. locations. Although it may be very effective in even larger areas as well, the application would depend on the amount of odors, the general space configuration, and the overall air exchange. As such, the efficiently priced Original continues to be the choice for individuals requiring assistance in large rooms, up to entire floors in homes and in business locations. The Original model is classy looking, and available in a two toned grey and silver. Its compact size is roughly 3-1/2" tall x 4" diameter wide (about the size of a small grapefruit) allows it to fit in nicely just about anywhere. Like all Csonka AirCare Purifier Smoker Cloaker models, the Original is virtually silent in operation. No dissatisfied customers means no returned products, 100% guaranteed!